Shell / Nederlandse Aardolie Maatschappij BV (NAM), a major operator in Europe, has recently ordered a bespoke Hot Make Hot Break (HMHB) for delivery to the Southern North Sea gas fields. The receptacle side of the Hot Make Hot Break connector will be mounted onto the operator’s vessel in order to provide a full-bore, plug-and-play, Emergency Quick Disconnect (EQD) safety system. The connector will be used for the high-pressure, high-flow transfer of gas between the platform and vessel. Shell’s Hot Make Hot Break is designed to disconnect both passively (mechanically) and actively (hydraulically). It will disconnect autonomously if the vessel loses dynamic positioning. Once the tension in the transfer hose exceeds a defined load of 3.5 Tonnes, the Hot Make Hot Break will separate and seal instantly on both the stab and receptacle sides of the connector. This specific breakout load is controlled by 2 tension pins. Following disconnection, the stab and connected hose will transit overboard the vessel, guided by a 45degree decline chute. The Hot Make Hot Break will disconnect even at full working pressure of 10,000psi and with no fluid loss or line contamination. 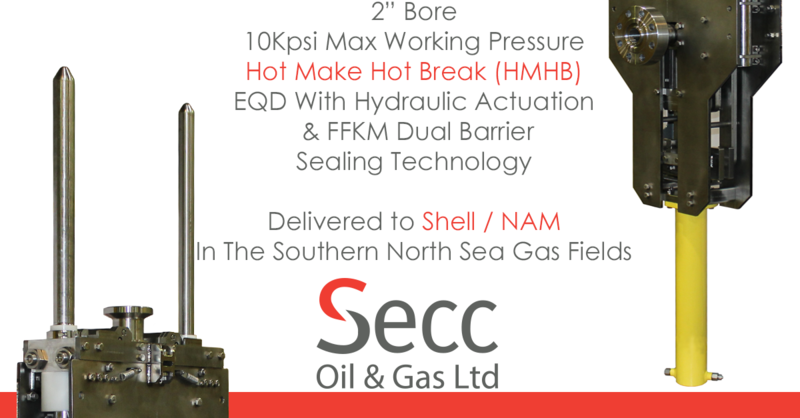 The Hot Make Hot Break (HMHB) therefore delivers a high level of protection for Shell’s crew, equipment and the environment during intervention operations. Click here the Hot Make Hot Break (HMHB) data sheet.